It is the early morning of June 22, 1941. In just a few hours Germany will launch the largest invasion in military history. Three million men along an 1,800 mile front that stretches from the Arctic to the Black Sea will attempt to conquer the largest country in the world--Russia! Germany has been preparing for this attack for more than a year, and is confident of success. Moreover, it appears this was done in secrecy, and the imminent attack will come as a complete surprise to the Russians. The strategy is simple: use the blitzkrieg technique that worked so well in Poland, Belgium, and France to overwhelm the poorly trained and poorly equipped Russian army. If this can be accomplished within the first few weeks, Russia will certainly be doomed. The Russian army is in a state of disarray. It is still trying to recover from Stalin's murderous purge of thousands of its best officers. The result is a great lack of leadership and experience at all command levels. Russia must absorb the initial blows and use the sheer size of the country to their advantage. This might buy enough time to bring their equipment up to date, and marshal their forces to put up a strong defense of Moscow. You will command one of the German army groups, or the forces of Russia. The tasks of each side are daunting. Can you do better than the Germans actually did and advance your troops a mere 30 more miles to take Moscow? Can you take Leningrad, or reach the Caucasus oil fields? Germany was able to do neither. As Russia, can you overcome a serious deficit in equipment and manpower to repel the German invaders? These are just some of the questions to be answered in Operation Barbarossa! A. As of Version 2, it is professionally printed on four 11"x17" card stock sheets that create a 22" x 34" play area. A tiny square of scotch tape on the bottom side can hold the pieces together nicely. A. Any of the Axis&Allies games will have pieces that work well: Infantry, Armor, Artillery, Fighters, Bombers, Territory Control Tokens, and Money. If your A&A has no Artillery, use Anti-Aircraft Guns. The rulebook contains detailed instructions for non A&A players (and some accidentally left-in references to the paper pieces from past versions). Use of proxies for units OK.
Q. What about some of the territory borders? A. Treat blue lines as territory borders and as Army Group zones. You may not travel diagonally across a "4 corners" or "+" looking border. Territories that are supposed to be adjacent are all very clearly adjacent. If there is any doubt, then it is not adjacent (the territory north of Kiev is not adjacent to the oil field east of Kiev). A. Sure. 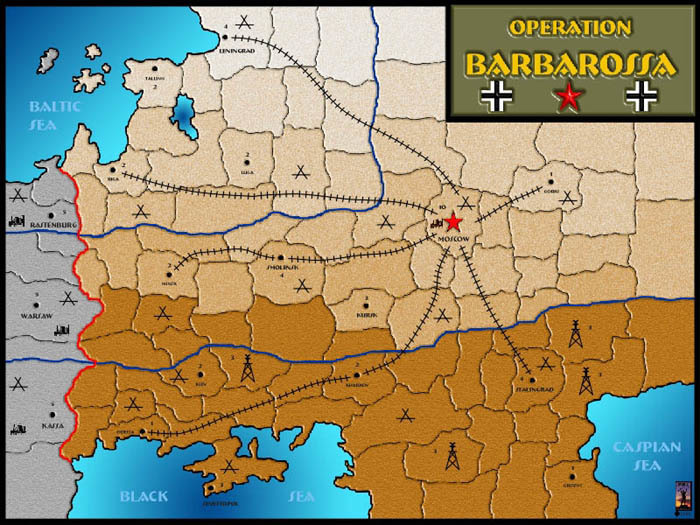 Up to 4 people can play, one controlling each German army group (North, Center, and South), and one playing Russia. Russia gets 5 factories to place in the cities of their choosing at the beginning of the game. Each produces a specific unit type (I, I, A, F, B). Germany can't see anything in Russian cities. Russia keeps its units and factories hidden from view on a city card. When Russian troops move out of cities, they are moved from the city card to the main board. Railroads connect many of the Russian cities, which they can use to non-combat troops from city to city hidden from German view. Germany may try to cut the rails to limit Russian movement. Germany may scout Russian cities with a bomber to try and find out what is there, however, you can't scout and attack on the same army group's turn. Therefore, one army group must scout, and the next in the turn sequence can attack. The German players must work closely together in this game. German troops may be transferred from one army group to another, and are then controlled by that new groups player. Because of the hidden units, it is a game of high tension on both sides. Most of the time Germany isn't really sure what Russia has in a city it is about to attack. And, most of the time, Russia has nowhere near enough troops to defend everything they need to defend. There is a lot of cat and mouse, educated guessing, and downright devious strategy ("Hum, he would expect me to do this, so I'll do that. But he might be counting on me taking the less obvious choice..."
The goal is for Germany to take Moscow, but to do this, they almost always need to take out the Russian factories which are producing units closer to the front. To make matters worse, Russia can dismantle, and move each of their factories once to another city. So, just when you think you have it all figured out... We're usually nervous wrecks by the end of a game...and usually ready to start another one right away! That's why we said, "Hey, this is fun. Let's sell it." Q. Can Artillery move one space, join up with Infantry, and then attack together? A. Yes. As long as the Artillery and Infantry are in the same space on the way to the attack, then the Infantry get the bonus. So, technically, Artillery don't have to start in the same territory as the Infantry, they just have to travel to the battle with the Infantry. Artillery and Infantry can enter a battle from different territories, but if they do, the Infantry do not get the bonus. Q. What about AA guns now that I'm using them for Artillery? A. Anti-Aircraft as a unit was removed from the game at Version 2. Instead, each factory (including the built in factories in the German cities and in Moscow) has a built in AA gun. Q. Do multiple factories provide multiple Anti-Aircraft guns? A. No. You only get 1 AA roll per airplane no matter how many factories are in the city. Q. Was the game setup altered in Version 2 to include Artillery? A. Yes. Germany's Army Group North starting position is Rastenburg and includes 8 infantry, 4 armor, 2 artillery, 1 fighter, and 1 bomber. Army Group Center starts in Warsaw and includes 12 infantry, 8 armor, 2 artillery, 2 fighters, and 1 bomber. Army Group South starts in Kassa and includes 10 infantry, 5 armor, 2 artillery, 1 fighter, and 1 bomber. Russia's territory east of Rastenburg includes 1 infantry, 1 armor, and 1 artillery. Russia's territory northeast of Warsaw includes 2 infantry, 1 armor, and 2 artillery. Russia's territory northeast of Kassa includes 1 infantry, 1 armor, and 1 artillery. Moscow starts with 5 infantry, 1 bomber, 1 artillery. All other Russian setup remains unchanged. Q. Can armor blitz through friendly or captured cities? Can armor blitz through a territory adjacent to a defending fighter? A. YES for friendly cities. NO for enemy cities even if they are empty. Fighters may defend adjacent territories whether there are any other defending units there or not. So yes, a fighter can stop a blitz if its owner wishes to risk its destruction. It could then retreat the next round if it survives and there are no enemy fighters. Q. Can air units move over sea areas? A. No. Sea areas are off limits. There are no naval units in Barbarossa. Q. After bombers transporting paratroopers survive AA. fire, can they be destroyed in the regular combat that follows? A. Yes. They don't get to attack, but they can be casualties. Q. Do the bomber and the paratrooper have to start in same the territory? A. Yes. Bombers cannot pick up a paratrooper along the way or after the infantry has moved. Q. In the same army group area, can you scout a city in the same turn before you decide whether to attack it or not? A. No. You would have to scout on a previous army group's turn. Q. If the Russians take back a rail area in the combat phase and it restores the rail link between two cities that started that turn under Russian control, can they, use that rail section in the non-combat phase? A. Yes. You cannot, however, non-combat troops into a freshly taken city. Q. Why can't the Germans use the rails? Why can the Russians use freshly recaptured rails? A. Aside from game balance issues, Russian rails are a different width than German trains. The Germans occupy but don't destroy the rails, so the Russians can repair and use them immediately after the route is back under Russian control. Q. Once Moscow is captured by the Germans, then retaken by the Russians, are Moscow's production capabilities restored? A. Yes. Units may be placed there on the next Russian turn. Q. If fighters are sent to defend an adjacent area that is being attacked with fighters in the attacking force, can the defending fighters retreat? A. No. As long as there are attacking fighters, then defending fighters must remain. If the attacking fighters are destroyed, then the defending fighters may retreat before any combat round to any airbase within range (page 7/8). 1 of their 4 movement points is used up if they have moved to defend an adjacent territory. If the fighters do not retreat (i.e. the defenders won the fight), then they must land at the adjacent airbase they came from. Q. If Gorki is captured and then retaken by the Russians, can the free units start coming on again? A. Yes. But as long as Germany holds Gorki, Russia gets no free units. Q. Are cities and the territories they reside in considered 1 or 2 territories? A. One. The city and territory it resides within are one in the same. Q. Can you blockade a city? Q. How can Germany win? A. Try a central push strategy. Keep the bulk of your force together for defensive strength and within striking distance of 2 or more key cities forcing the Russians to spread their defense out. Use Army Group North to scout and AGCentral to attack. Get to Smolensk as soon as you can. Use AGNorth's turn/units to break through the Central Soviet line, then blitz through with AGCentral. Q. How can Russia win? A. Always build infantry in the front cities. Use these to move out into the territories to stall the German blitz. You need just enough Artillery and Armor to be able to attack smaller groups of Germans especially German Armor if/when they are vulnerable. Russia has the money to replace troops, while Germany really does not. Kill off Germany's good attacking units at every opportunity.